I am still in a mild state of shock that so many professional economists apparently doubt that demand curves slope downward. I admit upfront that I have not spent more than an hour or so looking through the latest literature reviews on the topic. Nonetheless, I remain unrepentant: I think increasing the price of unskilled labor by 24% will make employers hire fewer labor hours. The burden of proof is on the doubters to show why this isn’t so. Wow, look at that. It’s almost as if employers respond to incentives on the margin. Monopsony. One claim is that the Econ 101 logic breaks down because employers have market power. But hang on a second. If you want to tell me that the wages of, say, brain surgeons are below the competitive equilibrium, since there are only a few employers who can form a cartel, then OK I’ll at least give you a few moments to make your case. But you’re telling me there is a cartel of employers who are willing to hire unskilled labor?! That is literally the most non-specific factor of production on planet Earth. You need labor for everything, and by definition, unskilled labor is not suited for one occupation more than another. I think the reason this might initially sound plausible to people, is that there aren’t a lot of teenagers working all over the place. You just see them concentrated in a few areas, like fast-food restaurants. But do you know why? Because of the ()#%$#$ minimum wage (and school attendance laws)! You actually do see young people in various professional businesses and halls of government. They’re called interns. So we’ve got lots of young people finding employers willing to take them on at $0/hour, and yet apparently there is this “indeterminate bargaining zone” where employers’ quantity of labor demanded is the same between 1 cent and $7.25 (or $9). Does this range also count as a “modest increase”? Or does even Krugman admit that getting rid of the minimum wage altogether would help reduce the 25%+ teen unemployment rate, while increasing it from $7.25 to $9 would be negligible in the other direction? Studies look at employment growth, not unemployment rates. Apparently the standard thing to do in these studies is look at how much the absolute amount of employment or labor hours changes, rather than looking at the unemployment percentage. The idea (I gather) is that a high minimum wage can draw people into the labor market who can’t find a job, but these people wouldn’t have had a job anyway, so it’s not a strike against the system. Only if employers actually reduce the quantity demanded, can we say (some) workers are hurt. But even on its own terms, this argument fails. The most desperate, vulnerable people are the ones who will work for, say, $5/hour. At that rate, fewer middle-class college kids will enter the labor market. But bump up the wage rate to $7.25, and now a bunch of suburban white kids take a part time job at Pizza Hut to make a little extra money. Even if the total payroll and hours worked doesn’t change, it still means these kids bump out the new immigrant who barely speaks English and needs to get his foot in the door to establish a work history. Studies correct employment growth for broader trends. My very quick reading of the literature suggested that the empirical studies in the olden days did find a strong connection between a minimum wage hike, and reduced hiring among teens. But, the newer wave of studies disputes that finding. One of the “corrections” the new studies make, is to adjust the change in teen hiring compared to the broader labor market, which presumably isn’t affected by a minimum wage hike. Yet hang on a second. Even in the “natural” experiments, I would imagine a state legislature that jacks up the minimum wage is also more likely to do other “progressive” things that hurt employment growth. So things still move in the same direction, but now you’re not going to get as clear a signal; it’s hard to disentangle why the teenagers in California can’t get a job–is it because of the minimum wage hike, or because of their outrageously progressive income tax code? Studies focus on fast-food employment across county or state lines. Again, I am not claiming to be an expert on this stuff, but it looked like a lot of the really “compelling” studies looked at natural experiments where you had similar conditions except a chain of restaurants fell in one jurisdiction that raised its minimum wage, while the other restaurants in the chain fell in an adjacent jurisdiction that didn’t. Seems like a perfect laboratory test right? But hang on. If the minimum wage in one state makes it profitable for the restaurant to bite the bullet and install a bunch of labor-saving machinery (like the drink dispensers that you put the cup under and hit a button and walk away, unlike what they used to do when I was growing up where you had to hold the cup in place on the nozzle), then it would be pretty easy for that restaurant chain to use the same, new design when opening up new locations in other states with the original minimum wage. By the same token, even longitudinally looking at the same actual restaurant, once they redesign the place to be run by (say) 4 responsible teenagers and a manager, instead of (say) 9 goof-off teenagers and a manager, then even if that state later abolishes its higher-than-federal minimum wage, the damage is done; the restaurant isn’t going back to the old model. How does this square with the Keynesian story about monetary stimulus? Finally, how the heck does this whole minimum wage digression line up with Krugman et al. constantly telling us that the problem in Europe and elsewhere, is that wages are too high relative to the price level? They tell us that if we engage in a currency war, we’ll all be better off because prices will rise, making it profitable for employers to hire once again. So, are they saying prices will need to rise by more than 24 percent, in order for the teen unemployment rate to budge? I’m sorry, I just get the feeling that the story changes to fit the progressive policy of the day. And again, I am not burying my head in the sand and refusing to accept something obvious: On the contrary, I am saying demand curves slope downward, and I can point to all sorts of obvious evidence to back that up. Indeed, the Keynesians themselves think employers follow the same logic I’m talking about, when it comes to their proposals for monetary stimulus. Yet somehow, the old empirical consensus on the minimum wage has been overturned by a wave of new studies of “natural experiments,” so I’m giving reasons in this post why those studies might be missing the obvious conclusion staring us all in the face: Making teenagers 24% more expensive in the middle of a depression is not the way to help teenagers. So the minimum wage is a club good that benefits the older at the expense of the younger. What is the policy implication? Does this mean we need to expand the voter base to include those younger than 18? In honesty, if the government lets them work, isn’t it taxation without representation? Of course they’d probably see it more fit to stop letting them work. Great point about interns. One of the perverse consequences of min-wage laws is that they have to work for free, even if an employer were willing to give them, say, $5/hr. That’s not enough to live on–but wouldn’t an extra $800/month sure be nicer than nothing for a young person still living with their parents? If the graph is correct, then surely the stricter min-wages laws in Spain (€744.92 in 12 payments, €638.50 in 14 payments, or $11,426/year), Greece (€586 a month), and France (€9.40 per hour; €1,425.67 per month for 151.67 hours worked) are having a devastating effect on young workers. It gives young workers an immediate incentive to get education rather than work for little pay – something which will help them, and the economy, more in the long term. That’s (yet) another example of the absurdity of the entire concept of the minimum wage: You can employ for $0/hour, you can employ for $X per hour, you just can’t employ for in-between. Huh? That is one more reason why I think minimum wage laws derive from a psychological resentment of the poor, contrary to the protestations of (faux) non-selfish altruism. For who are the people who can most afford to work for free as interns? Those from relatively more well to do families, not the poor. So there is no ban on free labor. If most poor people miraculously started to work for free (unlikely, but for the sake of argument), then I expect there would be a ban put on free labor too. It seems even you have some common ground somewhere. If I recall correctly, the Card-Krueger argument for monopsony power isn’t really based on a supposed lack of competition. It’s that low-skill labor markets have a very high rate of turnover, and therefore employers have to set a wage that balances new hires with new quits in order to maintain a target employment level. This means they can’t hire any number of workers at the going wage, as the perfectly competitive model would require. Instead, they have to raise wages to hire more workers, so the firm faces an upward-sloping supply curve. Anyway, I’m not endorsing the argument, just reporting it. At one time I checked the math and it works. That doesn’t mean it’s true empirically. It sounds absolutely trivial to argue that for compensating high turnover of workers you have to increase pay to compensate for this or reduce turnover. How is this in any way bad for workers if they get more or proves that there is monopsony? I rather think that is an argument against monopsony power. I guess you mean to the right? I thought that is what supply curves are supposed to do usually. Yes, that is what a *market* supply curve usually does. That’s why I included a parenthetical paragraph in response to that objection. In the perfectly competition model of an input market, supply and demand set the market wage, which is then *taken as given* by the individual firm. The firm can then hire as many or as few workers as it wants at that wage; this is the price-taking assumption. You might say that’s a ridiculous assumption. But if so, then you are also accepting that there is *some degree* of monopsony power (keep in mind that there’s a spectrum between perfect competition and full monopsony). If the firm has to pay higher wages to maintain a larger workforce, it has some amount of monopsony power, and the question is just how much. If this sounds odd, think of it this way: the firm has the power to set wages rather than just accepting the market wage. Here’s a simple version of the math. Say you currently hire 10 workers at $5/hour. To attract 11 workers, you’d need a higher wage of $5.10. If you offered that wage, your total wage bill would rise from 10 x $5 = $50 to 11 x $5.10 = $56.10. So the added cost of going from 10 to 11 workers is $6.10 — which is higher than the wage, because you also had to pay everyone (not just the new guy) an extra $0.10/hour. (Rapid turnover means you can’t easily pay differential wages.) Say the 11th worker is worth $5.50 in added revenues. You won’t hire him, because that’s less than $6.10. But now suppose a minimum wage of $5.10 is imposed. Your first 10 workers now cost you $51 anyway (compared to $50 without the minimum wage). That means adding the 11th only adds another $5.10, which is less than $5.50, and therefore the 11th worker is worth hiring after all. Sorry, saw your answer only now. Thanks for that example. Yet what if those 1 USD loss that the firm would make when it would hire 11 people instead of 10 means that the 11th worker is employed elsewhere in the economy more efficiently? Therefore a minimum wage would do nothing more than distort market conditions to a less productive state and only make it artificially profitable for this one firm. Not to mention that for other firms who might have been on the margin already, now will have to lay off workers, probably more than this one firm will hire… Well I mean how high is the possibility that a minimum wage will increase the level of employment? Given a falling demand curve for labor it is nearly impossible, which means those who are unable to find a job now are those paying the bill for those workers left employed now enjoying higher (nominal) wages. Why do you say that efficiency is necessarily “damage”? As a technologist myself I take mild umbrage to the idea that business somehow serves the primary purpose of hiring people instead of buying machines. The balance between labor and capital, like anything else, should be determined by the market. The fact that you like technology isn’t any more relevant than the fact that your political opponents like people. If hiring additional teenagers at a low wage is more efficient than investing in new capital, that is the “right” thing to do. “Damage” means distortion. The primary purpose of business is neither to hire people nor to buy machines. But if the minimum wage is abolished and resutrants DO stick to their more capital intensive model, as Bob say they might, then that no longer is a distortion. In this case, the distortion is the additional costs of the investment. But once the capital is in place, if continuing to run the buissnes in that capital-intensive way is the most efficient way of doing it, then that is neither a distortion or a damage. The market deals only with the conditions of the present, and the anticipations of the future, how the conditions of the present came to be is not relevant to the market. I think by “the damage is done”, Murphy means sunk costs as relating to new labor market requirements. I don’t think he’s attacking technological advancements. 1. Nobody,to my knowledge, has argued that demand curves do not slope downward. 2. Monopsony is econ 101 too, in most cases. People just doze off by that point in the semester. 3. Forget the natural experiments for a moment. Put the real value of the minimum wage on that chart instead of the nominal value and then put an inverse NGDP gap on it too and tell me if you still think it tells us that the minimum wage drives teenage unemployment rates. 4. re: “You need labor for everything, and by definition, unskilled labor is not suited for one occupation more than another” – except for, you know, skilled occupations. 1. Is that supposed to mean nobody in fact has argued that demand curves do not slope downward? Whether or not you are personally aware of something, has no bearing on whether or not that something is real. 2. Not in my class, which is also irrelevant. 3. Employers don’t hire labor based on the real value of wages. They hire based on the nominal costs of labor, the nominal prices they can sell their output/goods, and other nominal factors specific to their respective businesses. Employers who sell capital goods for example would likely not hire or fire workers, or pay more or less for labor, if the prices of consumer goods change in some basket or index. OK, are you just saying really what your position is, is that there is a discontinuity in the demand curve, that it has a vertical strip between $7.25 and $9? If that’s what you’re saying, then yes, I should be more accurate in the future. ??? That same inverse NGDP gap is what you would use to explain the total unemployment rate though, right? So why does an NGDP gap seem to hurt teenagers more, and why does it really stick it to them whenever the minimum wage gets raised? I haven’t seen any of you even try to answer that issue, let alone satisfactorily. Wrong again, Zod. A brain surgeon could hire unskilled teenagers to constantly make coffee in the waiting room, to greet customers at the door, to help old ladies to their car, to play with the little kids of the patients, etc. But you don’t see that pattern because of the minimum wage. I believe one D Kuehn has argued that the slope is so close to flat as too be indistinguishable from flat. In infer this from his assertion that raising the price of a unit of labor does not decrease the units of labor demanded. If you know this good fellow, can you ask him to explain what I missed? Their theory isn’t so much one of standard monopsony, but rather dynamic monopsony. The theory doesn’t rely on employer cartels but rather labor market frictions such as search costs. Supposedly, these frictions ensure that all firms face an upward sloping supply curve for labor which allows them pay a wage below the competitive equilibrium. It’s basically the labor market equivalent of monopolistic competition. I would be interested in hearing your thoughts on that. And doesn’t firms have search costs for new labor as well, which can be abused by the workers currently employed by the firm? What I want to say with it is, without having really only one firm or at least a cartel of firms buying labor, monopsony power doesn’t make sense and becomes meaningless. Because unlike other costs, search costs influence matching behavior. Can you alaborate on why “search costs influence matching behavior” is special and cause monopsony power while search costs for a new lap top that influence decission making do not create monopoly power? it is ‘elaborate’ and ‘decision’ of course… sorry..
Who says search costs for goods don’t create monopoly power? I’m not sure I agree that search is the only thing that gives these employers monopsony power, I’m just pointing out that search costs are different from production costs. I just want to hear what creates unfair pricing power in your view. Well if you want to argue that all search costs create some form of monopoly/monopsony power then at least you are consistent. Yet as I have asked above, then also laborers have monopoly power because firms also have search costs as well, which in my view makes the concept meaningless, since in the real world there is nothing that has no search costs, it makes all market participants monopolists and monopsonists. I’m not sure what “unfair” has to do with it skylien. I wouldn’t call it unfair. Workers command some monopoly power over their labor, of course. I’d imagine none of us are satisfied with just determining whether they have any, right? Well I thought the whole issue is that monopsony/monopoly is some immoral thing that should be put right by declaring specific laws like minimum wage or institute a break up of a firm etc.. Yet when you say monopoly and monopsony are fine and fair, why is monopsony then used as argument for minimum wages laws if it doesn’t imply a charge of “unfair” pricing power? Where did you get the idea that it is immoral? Even if it were “immoral” I’m not usually a fan of legislating morality. Monopsony occurs when a firm has market power in employing workers at a wage below the competitive equilibrium. It means the wage workers are paid will be lower than the marginal revenue product (MRP) of labour. This leads to an unfair distribution of income away from workers. Again the inequality arises from some firms having the power to set wage rates. I would like to have an answer on why is monopsony power used as argument for minimum wage laws if it doesn’t imply a charge of “unfair” pricing power (unfair = immoral). Am I the only one who thinks that monopoly and monopsony is understood by most people to be bad and unfair? I don’t think the ethics are the concern here but the economics. I generally think of monopsony power as the explanation for why we don’t see big negative employment effects associated with the minimum wage. I don’t think of it as having the moral things you’re attaching to it. It may explain things we don’t like (inequality), but I’m not sure it makes sense to call it immoral. People think technological change causes a lot of inequality, but I don’t think they’re arguing technological change is immoral. Now, you bring up “most people”. If you ask most people whether monopsony is moral they’ll say “huh?”. If you ask most people whether monopoly is immoral, they may very well say “yes”. Needless to say, that’s not really the perspective of economists even those who think monopoly power might offer a reason to do certain things sometimes. The presumption of monopoly power on the part of firms is pretty standard. Interestingly, the presumption of monopsony power is less standard. The unskilled labor market (the market most closely associated with minimum wage laws) is perhaps the best example of an antithesis of monopsony. Your statement “I generally think of monopsony power as the explanation for why we don’t see big negative employment effects associated with the minimum wage” cannot be given a coherent meaning, because “big negative” is too subjective a term. One person may believe that there isn’t a big increase because they look at the 1% rise in unemployment, while someone else may believe that there is a big increase because they’re looking at the total number. For me, JUST ONE additional unemployed person makes the entire minimum wage law unjustified. No law should be passed that violates individual rights (to trade his labor for another’s money). Of course it doesn’t have to be emphasized that you don’t speak that language. Most people just don’t know the word, yet they understand the concept (at least to the degree they understand it for monopoly as well). You just need to explain that monopsony is basically the same as monopoly, except that instead of the firm abusing its customers by “overcharging” them for its products, it abuses its workers by “underpaying” them. I write “abusing” above because that is what most people understand when you say to them “they charge a higher price than the competitive price” or “they pay less than the competitive wage”. Ok. So if there is no reason for minimum wage because of fairness then having only low negative effects is not reason enough to promote minimum wage increases, and it should therefore be opposed. A small negative effect is still a negative effect. BTW the logic for why you think (which I do not share at all) that there is only a little effect on employment because of monoposnic effects can be countered by pointing to the monopoly power of the workers as well who put also search costs on the firm for alternative personal, machinery, procedures etc… And you cannot say which is greater. Yet even if this were right, there would be the question of where is this sweet spot at which all the room given by monopsonic power is used up? You are unfortunately not able to calculate the “proper competitive” wage (Which interestingly treats the knowledge problem obviously as something not real or not proper at least not competitive). So all suggestions of this or that rate of minimum wage are nothing but wild arbitrary guesses. You just don’t know if you are operating above or below the “proper competitive” wage. Not even mentioned that a single rate of minimum wage doesn’t address the problem in a quite complex economy with millions of different jobs with all having different “competitive” wages. But it’s not hard as long as you don’t do a cross-sectional look like you did the other day! If income taxes don’t change but the minimum wage does it is trivial to disentangle. Yes, in principle, and yes, if we had a bunch of state legislatures that randomly picked policies–some of them implemented a flat tax and abolished legal tender laws, at the same time they jacked up the minimum wage 50%. But I don’t think you’re going to really see such “natural experiments” in the real world, do you? So when you run an apparently sophisticated regression, which assumes these changes *are* truly independent variables, then you’re going to get weak results that seem to contradict basic economic logic (such as: raising the price of something 24% across the nation will reduce the aggregate quantity demanded). Also Daniel, can you please confirm: When we get the currency war Krugman wants, prices will need to rise by how much before we see any movement on the teenage unemployment front? Here’s a summary of the numerous problems with the Card Krueger study. Needles to say, if all of the ‘new’ minimum wage research is this poor then something besides a quest for scientific knowledge is driving the push for a minimum wage among economists. How do you conduct a minimum wage study like this without measuring labor hours worked!? …until Keynes entered the scene. Keynes provided a series of contorted and twisted (old mercantilist redux) arguments that higher wages are good for the economy. In the rising tide of cultural acceptance of Marx’s exploitation theory, economists no longer had to appear as haters of mankind. They found a needed excuse with Keynes, and one by one, they joined in the calls for the government to try to increase wages by law. There has been a positive portion of the economics establishment that has carried over this tradition ever since. The modern way to do it is to massage and manipulate data so as to reach the palatable, perhaps even desired, conclusion. This is a dead on analysis, Bob. Well done. I can’t find a single flaw in your argument. This paragraph is nauseating (not directed at you, but the studies). How many times do “latest studies”, which show conclusions contrary to economic logic, where dubious “corrections” abound, are glossed over and/or accepted without much critical thought by those wanting minimum wage laws? I can see it now “Didn’t you hear? The old logic has been overturned! The data say something new now!” No it doesn’t. What’s new is the style of data massaging, as always. Great work. This is why you are a master. Bravo on the point about (lack of) monopsony. Here is another story — taken seriously by labor economists — about why a rising minimum wage can increase employment. Say you own a McDonald’s and you hire a kid to work 11AM to 7PM. He’s very busy during the lunch and dinner hours, and pretty much loafs in between. Now the minimum wage goes up. Suddenly you’re no longer willing to pay this kid to loaf. So instead, you hire one kid to come in for an hour at lunch time and another to come in for an hour at dinner time. Employment — the number of people who work some postiive number of hours per day — goes up, though labor hours go down. Card and Kreuger looked at the former, not the latter. Arguably, this is an important part of what drives their results. If the supply price to a business of its resources rose by 24%, what would the business do? Raise the price of its output? Take a cut in its profit? Why is the cost associated with employees any different to other (raw) material costs/inputs? Why can a raise in those be accepted to result in a price of its outputs going up but not a raise in the wages of its employees? To use the McDonalds example, if the price of burger buns goes up then McDonalds raises the price of burgers. Or to use the above example, why would an employer ever want to pay someone for just loafing about? Is the employer effectively willing to be a provider of welfare – really? Seems like that is a cost that can be cut right there irrespective of the minimum wage. I’m pissed every time they do this because I get a pay cut. As a restaurant labored, every time they hire a newbie, at a even larger rate than last time they hiked minimum wage, my value has decreased. As a layman, without a degree in anything, I know minimum wage laws are wrong because now the imbecil that just got hired only needs to earn a smaller percentage of his wage to equal the wage I have worked 20 plus years to acquire. My value as a knowledgeable restaurant person is lost every time they do this. I’m back in school to get a skill other than babysitting teenagers. Employers are indecent to not pay a man a wage that pays their bills. Support the passage of legislation of $9.00 an hour. Hillary Clinton would have had the minimum wagers in the soup lines starving because the moment you get a raise..the company would lay off the entire crew and rehire at the minimum wage level to cut company expenses or send the job overseas to get their products made with $2.00 hour labor in China/Japan/India/ or Mexico!! Give us our pay to cover rent,utilities, food, auto ins, health ins, etc…and recreation. That chart is BS. The job losses were due to the Great Recession caused by the subprime mortgage crisis. They had precisely zero to do with the minimum wage hike. Amazing how you can spout so much economics and yet not see the simplest of causality errors. Bravo. Ponta, you know that the line is showing the DIFFERENCE between the total and the teenage unemployment rate, right? Nobody here even bothered to check, did they? You saw the chart, it agreed with what you wanted to believe, end of thought process. You ask me for proof? Okay. Here it is. Fact: Unemployment for teens *always* rises at a higher rate than does general unemployment rate during and immediately after a recession. Every time. BLS stats for unemployment for teen workers specifically (16-19 years old) minus the average unemployment rate for all workers, from Jan. 1948 to present, periods of recession highlighted. You will note that teen unemployment relative to the national average spikes sharply, EVERY TIME, immediately during and after a recession. There is no such correlation between minimum wage hikes and teen unemployment. Why? Obvious: younger workers have jobs in industries which suffer more during recessions (retail, restaurants, other hospitality); quite simply, they work where jobs are most lost when the economy goes bad. In addition, in a recession, when the economy is losing jobs (as we were losing jobs by the hundreds of thousands in the Great Recession), prime-age workers begin applying more and more for minimum-wage jobs, and since adults are far more attractive to hirers than are high-school teens, the older workers win out. They’re called “facts,” ladies and gents. They’re augmented by things called “research” and “critical thinking.” Try using them next time instead of mindlessly accepting fatuous claims from biased publications. You yourself just responded to the charts, saw what you wanted to believe, and ended your thought process. That is in large part because of the overpriced labor on account of the minimum wage laws, and the folks who are most likely to earn minimum wages are teens. That is a “fact” that requires correct theory to understand. If the price of labor were market driven instead, then phenomena of government induced recessions would result in fewer teens losing their jobs. Nobody claimed that recessions do not adversely affect teen laborers. The claim is whether, ceteris paribus, minimum wage laws cause lower employment. This theory is not falsified by pointing to ADDITIONAL causes of teen unemployment. What you are doing is taking what you already believe, namely that minimum wage laws do not reduce employment, and you are trying to blame other factors as the sole cause, despite the impossibility of historical observations to split a given quantity of unemployment according to specific factor. That is because the government typically raises the minimum wage only after the market rate is appreciably higher, such that any unemployment caused by the laws themselves, won’t show as a TEMPORAL change, but rather a counterfactual. But if correlations are going to be (incorrectly) thought of as the only valid test, then studies have shown that there IS a correlation. …which minimum wage laws make even worse. See that everyone? This commenter just inadvertantly argued the position he is ostensibly trying to disprove, namely, that because teens are legally prohibited from competing with older more experienced workers on price, that they are the most adversely affected by the minimum wage laws. You want facts? There you go. I have a mirror to sell. Do you want it? I have to charge you a higher price on account of the higher priced labor I am using. First off, teens make up 24% of the minimum wage workforce. http://pewrsr.ch/13FB132 Oops. If you can’t get the basics right, exactly why should I trust you on anything else? Second, your larger point is not a “fact,” but a “theory.” You give no actual evidence to support the claim that higher teen unemployment is driven by higher wages. It is not supported by the evidence, which strongly indicates the opposite of your claim. Moreover, job losses in a recession are driven by lowered *consumption,* causing less need for employees. If a restaurant suffers, say, a 20% loss in customers, then it is not a question of how much the business pays its employees, but rather how many employees are needed to meet the demand. No, if the price of labor were market-driven, then you would have essentially the same number of employees, but each would be earning a *lot* less. Hiring is not driven by the largesse of employers but instead by demand. Moreover, lower wages, not higher ones, are part of the cause of recession. Baloney. You’re making up an excuse to cover up a significant oversight in the original argument. The article and discussion is based upon the chart, which falsely lines up recessionary unemployment with the minimum wage to make the false implication that the unemployment is caused by the minimum wage. If the main point were otherwise, then the word “recession” would have popped up somewhere in the main article or the discussion. It did not. But hey, you used *Latin*! You *must* be right! Seriously? A single, theoretical article making a claim that spatially, higher minimum wage in one state will attract workers from neighboring states, as proof that there is a temporal link between a higher federal wage and teen unemployment? If it were in fact true, then we would see the same effect on the national level. Oops! We don’t! Unless you want to suggest that higher minimum wages in the U.S. cause higher unemployment in Canada and Mexico. Boy, that statement is messed up in a lot of ways. The most significant way is that you seem to think that it is preferable, in a recession, that prime-age workers be driven out of the market and thus suffer higher unemployment so that teens could work for a much lower wage. So, everyone gets paid less, more adults are out of jobs, and teens, though working more, will end up taking home less overall. Nicely handled. Overall, you make a lot of points with no actual evidence behind them. Hell, you don’t even know that teens are not the main earners of minimum wage. I’m not overly impressed. You misunderstood. I did not say teens made up the majority of the minimum wage range workforce, but that teens are more likely to earn minimum wage range jobs. This is why they are more affected by minimum wage laws, as well as bear the brunt, as a class, of fluctuations that require job reallocation and reductions. Perhaps instead of pretending your fallacious interpretations of the facts are somehow the actual facts in and of themselves, you should read more carefully. On the contrary, I provided you with such evidence. Perhaps if you had read my entire post before responding, as I did yours, you would have noticed it. Furthermore, it is you who is eliciting a theory. Your theory, unsupported by the evidence, is that minimum wage laws have no effect on employment. There are literally hundreds of peer reviewed papers in well established economic journals that falsify that theoretical claim. This is a particular theory of economics which is untenable. In actuality, lowered consumption is a consequence, an effect, of the same factors that caused the recession which had lowered consumption as a consequence. For consumption of workers lowers not because they have capriciously and arbitrarily decided to reduce consuming wealth, but because their incomes are being lowered, either actually or by observing other workers losing their jobs. This is caused by a reduction in investment, as it is investment, not consumption, that finances wage payments. Companies that have made errors reduce their investment after they are realized in the capital goods stages. This is why Recessions tend to always be concentrated in the capital goods industries. They, not the consumer industry, bear the relative brunt of most recessions. Retail and service sectors typically decline relatively less compared to the higher order capital stages. The doctrine of “underconsumption” as a cause of recessions is a long standing myth, spread by faulty economic theory that was mainly rehashed and partially redeveloped during the 20th century. I’ll respond to the rest of your post later. As of now, there is too much wrong in your post. Oh, bravo, Ponta — superb debunking of Murphy. A word of advice — Major_Freedom is simply a pathologically dishonest troll who thinks words can have any meaning he wants to give to them. You should approach his comments as a joke and for amusement. I know I have won the debate LK when you do not trust any new poster to come to his or her own conclusions about what I write. And you have not shown how Ponta “debunked” Murphy. He just elicited a challenge, which Murphy recognized. But debunking? Hardly. You are just saying that because you also believe in the myth that minimum wage laws raise wages. You are just trying to turn all academic debates into a tribal game of us against them, operating on your amygdala instead of your hippocampus. You have not shown me to be either dishonest, nor a troll, nor someone who thinks words can mean anything I only want them to mean. I have never shied away from defining the words I use, which is honesty on my part. You just have bad theory and a bad attitude. No, minimum wage laws does not raise wages. It only makes it illegal for workers whose market rate is lower than the minimum wage rate, from finding jobs at all. Telling employers that if they hire anybody, they must pay a price floor, does not automatically cause them to pay more wages. They just don’t hire workers whose marginal product is worth less than the minimum wage rate. Furthermore, even if average wage rates did fall, there would almost certainly be a rise in TOTAL wage payments, since all those workers who were legally banned out of the job market, would then be legally allowed to be paid wages. This would release funds to pay those wages that were not paid before. Investments postponed can be made. Workers in this envrionment would be earning a lot MORE, in real terms, which is the only terms to focus on. When you have more workers in the workforce, then there are two phenomena taking place if workers are each paid less in nominal terms. One, with lower wage rates, COSTS of production are lower, which allows for output prices to fall. This does not reduce real wages. Two, with more workers in the work force, and fewer unproductive workers who were still consuming resources while on the dole, raises total productivity and makes prices even lower still. The net result is an increase, not a decrease, in real wages. It would be like imagining the government imposing a $100 an hour minimum wage, and then after some time, abolishing it. This will make average wage rates fall, but it would make total wage payments skyrocket, and it would make production skyrocket. What happens with dropping a $100 an hour minimum wage law ALSO happens with dropping a $7.25 an hour minimum wage, or whatever, except the net upshot is of course less positive than with dropping $100 minimum. You seem to not grasp the difference between nominal wages and real wages, and you seem to not grasp the economic effects of price floors. Wage rates are a price. Price floors cause surpluses. A surplus in labor is another way of saying unemployment results. No, demand for output goods only directs where labor is to be directed. Hiring of labor as such is driven by saving and investing. The money paid to workers originates and keeps on coming out of, abstsining from consumption and saving instead. What you are falling prey to is the common fallacy of composition, namely, you take what is true for an individual business, that its entire existence and hiring depends on that individual business’ demand, and then the error is made that this relationship therefore describes the entire population of businesses in the aggregate. In the aggregate, the direction of the dependency is in the other direction. In the aggregate, demands are competitive and offsetting. Here, demand for output goods is actually in competition with demand for labor. Here, an increase in demand of output goods actually comes at the expense of all other demands, including labor, ceteris paribus. Just try paying a worker his salary AND buying yourself a hamburger, with the same $10.00. You can’t do it. You have to choose. The easiest way of understanding this truth is to imagine the demand for consumer goods rising, then rising some more, and again some more, higher and higher given people’s incomes. As this occurs, employers who pay wages will need to reduce what they would have paid in wages, because they also cannot do both with the same money. They too will be spending more and more consumer goods for themselves, and pay less and less wages to their workers. Now imagine this continuing. More and more consumption by sellers and employers, and less and less investment. At some point, consumption will become 100% of all spending. And, wage payments would collapse to 0%. But how can this be if consumption spending IS ALSO wage payments? This reductio is meant to show that when consumption is less than 100%, say 50%, of all spending, it is STILL the case that more consumption spending means less of every other spending, including wage payments, all else equal. You are actually not doing anything to help workers by buying consumer goods for yourself. You are only helping workers by paying them wages yourself as an employer. Consuming resources does not pay a cent to workers. That money is the return to the employers and it is THEY who invested and paid wages to the workers who provided you with the hamburgers. You can only increase worker wages by abstaining from buying those hamburgers for yourself, and instead hire workers and pay them wages instead. No, lower wages are a CURE for depressions and recessions. Lower prices is actually the cure, of which labor prices is but one price, and perhaps the most important price. Lower prices enables idle resources to be used profitably. Lower wage rates reduces costs of production, including the costs of capital goods. Lower cost capital goods makes those capital goods more marketable. It is no “excuse”. It is directing your attention towards the actual arguments of the theory you initially attacked. You committed an oversight. You overlooked the argument about minimum wage laws, and pretended that recessions are the only cause. You can keep using the word “false” all you want here. You do not seem to grasp that the chart does not disprove the effect of minimum wages on employment. Your dispute here is theoretical. You want to pretend that your theory is the only one consistent with the data. It is not. There are always more than one possible economic theory consistent with any date set. Correlations of two variables always have at least two possible theories consistent with that correlation. Either A caused B, or B caused A, or there is the third theory that neither A not B caused each other, but were each equally or similarly caused by C.
Now the observation that recessions seem to be correlated with teenage unemployment, is not evidence that teenage employment is unaffected by every other variable besides recessions. That is not how even the most crude positivism works. Moreover, what correlations cannot show are counterfactuals. Since minimum wage laws are permanent, correlations are a poor choice, and counterfactual argument is the better choice. Increases in minimum wage rates may make correlations workable, but even here, increases persistently and expectedly are associated with a positivrpe correlation between the increase and unemployment. “If the main point were otherwise, then the word “recession” would have popped up somewhere in the main article or the discussion. It did not. Is this supposed to be witty? Latin is used very often in economics. It is commonplace and not that interesting. No, that is a straw man. There is a reason governments do not raise the minimum wage to $100 an hour, today. They raise them along with market rate increases. You don’t understand the evidence because you don’t have a proper theory to even recognize it. Pop quiz time. Which number is larger: 0 or 1? Hint, the first number is how many studies you have cited here on this blog. Pop quiz time. Which number is larger: 0 or 1? Hint: The first number is how many studies you cited to support your claim. The second number is how many I did. Ponta-You’ve made a rather aggressive set of comments here on this very old post. So let me start my critique of this comment with a point of agreement. This is indeed true. So the correct thing to do, if one wants to determine the effect of the minimum wage, is to use prime age unemployment as an explanatory variable as well-ignoring for the moment that the minimum wage may cause unemployment for prime age workers, as well. Additionally, one needs to adjust the minimum wage for inflation. I prefer to use an index based on the gdp deflator, but using the consumer price index to get it to a monthly time scale, and removing any seasonal residual. If you follow the conversation that starts here I link to a spreadsheet where I do just this sort of analysis. My regression model prefers a positive coefficient for the minimum wage to explain the youth unemployment rate. I also find a greater than unity coefficient on prime age unemployment, so yes, you’re right about one thing: youth are hit harder by recessions! But my model accounts for that fact. This is contrary to your claim that “There is no such correlation between minimum wage hikes and teen unemployment.” in fact I find just such a correlation. Here, I’m afraid, you are simply wrong. 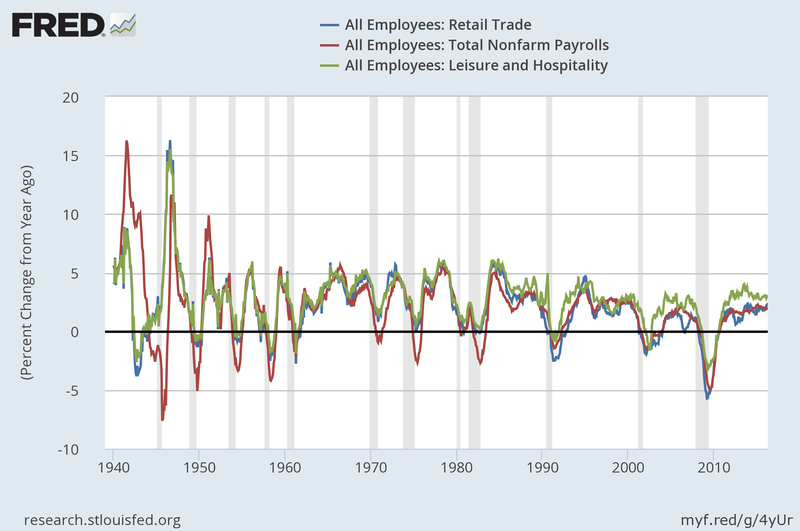 I know a little something about which sectors tend to be hardest hit during recessions by job losses, I’ve written something up about it Simply put, hospitality is far from the top of that list, and retail trade is middling. This is a statement indicating-though this should be obvious-that you don’t know how to think like an economist. The adult workers are more attractive given the high-in this case, controlled price. You’ve simply observed that high and low skilled labor are substitute inputs. And when faced with the Mother of All Sticky Wages, a legally binding price floor on hourly wages, the substitute input of higher productivity is more attractive at the same wage. Since the employer cannot offer young people sub minimum wages, instead they offer the minimum wage to older workers. This is exactly what economist would expect but for some reason you think it means they are wrong. I hope that was enough facts, research, and critical thinking for you. Mr. Murphy: you asked me if I realized that the chart showed the difference between the total and the teenage unemployment rate. I did. My point is still valid. I am still wondering if *you* were aware that teen unemployment always rises in the same way during recessions, and does not show the same correlation to wage increases. Because it appears that you were not. After all, if you were, then why did you not mention this fact at all, considering that it would, at the very least, be a significant factor in any analysis? It is far too great a correlation to simply ignore. Ponta, there are periods in your first chart that don’t fit the story you’re telling. E.g. in the middle of the 1960s, and in the early 1990s, those movements can’t really be due to the lingering effects of a recession. On the chart in my post, the movement starts upward before the main national problem from the 2007-2009 recession. Finally, there is the problem that often government officials raise the minimum wage during a recession in order to “help” the beleaguered workers. Also Ponta, to answer your specific question: This post was from more than 3 years ago, so I honestly don’t remember what was in my head when I posted it. For sure, it looks like the gap moves based on the minimum wage hikes, and is not simply a product of the Great Recession. And your longer history reinforces that to me, that although the gap goes up typically during and after a recession, that it’s not the only thing driving the gap. But, I don’t remember what was in my head 3 years ago when I posted it. I can say that in my recent (co-authored) book on health care, I said we can’t be sure that the Affordable Care Act is responsible for the big jump in part time versus full time employment, since that could be due to the Great Recession.